Here's an email from Xian Jie, one of my readers. He is a documentary filmmaker and his latest project, supported by the Lien Foundation, aims to raise awareness about dementia. I have been following your blog for a couple of years now and thought about letting you know about Before We Forget, a campaign I'm working on with a couple of friends to foster conversations about dementia. We have been working on a documentary and following two families for close to a year; this documentary will be released in September alongside 2 exhibitions. Right now we have launched this website - Before We Forget - to encourage Singaporeans to share their stories. We have also started a Photo Challenge. Dementia is a disease most commonly seen among old people. It's also commonly referred to as senility. The person's memory, attention and language and problem-solving abilities can all be affected. Badly affected persons may become so disoriented that they do not know what day of the week it is, or where they are, or who they are. 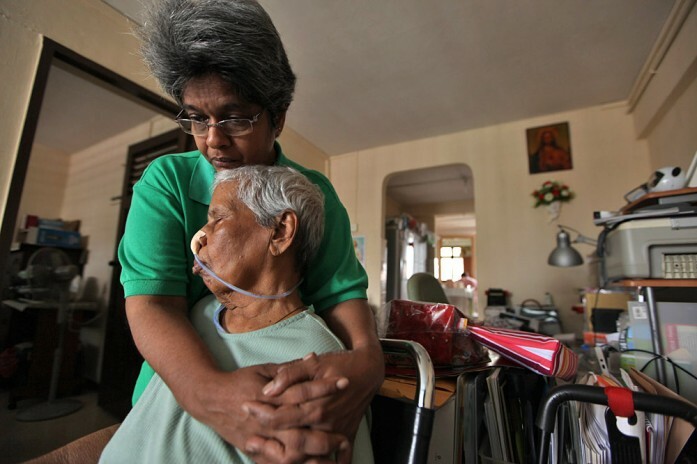 They can fail to recognise their own caregivers and loved ones. Do check out the links above, for more information. The organisers are also planning to organise two exhibitions (one at VivoCity and the other at the National Library) to raise public awareness about dementia. My grandmother had dementia, in the last few years of her life. I was a kid then. I still remember clearly how emotionally and physically exhausting it was for my family to care for her, in those days. By then she was already bed-ridden. My grandmother would have a meal (or a bath), and then an hour later, she would have completely forgotten that she had already had her meal (or her bath). And she would moan in agony, saying things like how come we didn't love her anymore and wouldn't let her eat nor bathe for days. One thing she constantly worried about was who would care for her beloved garden, after she died. To give her the comfort and reassurance that her garden would be okay, I took over the regular gardening duties. To me, looking after the garden felt like something that I could do, to help her die more peacefully. Here is a poem I wrote about those days. 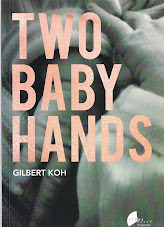 This poem appears in my book Two Baby Hands, and was also previously published in Singa, a now-defunct publication of the NUS Centre for the Fine Arts. the air was musty and sunlight never shone. for her. She could no longer do it for herself. Yet her life was linked to this place. to climb to light again. the kumquat branches would fill with orange fruit. In the years that passed, not a single bonsai died. A tree can live forever. long after she herself had left. That was a simple yet effective poem (I think). Much later I looked back and explored my memories of those days, and produced another poem - short, but much more challenging and psychologically complex. I was eight, and alone. come home, if I were bad. Make me hurt, for being bad. One more leg then, and another. Time crawled. I lost count. till I crushed it with a stone. Asian Cha is a website dedicated to poetry in Asia. In 2009, they published this poem. They were also sufficiently impressed to devote an entire essay to it. For the literature buffs among you, here's their commentary.